Rediff.com » Movies » Dabangg unveiled! The Dabangg team unveiled their movie in Mumbai over the weekend. The movie starring Salman Khan, his younger brother Arbaaz Khan, Sonakshi Sinha, Dimple Kapadia, Vinod Khanna and Sonu Soon releases this Friday. This is Arbaaz's first production. His wife, Malaika Arora has an item number in the film. 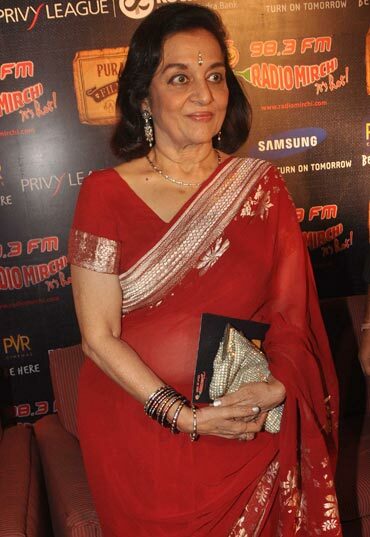 Bollywood movie veterans Asha Parekh and Shammi Kapoor here shared their thoughts at the special screening of 1966 box office hit movie Teesri Manzil in Mumbai over the weekend. 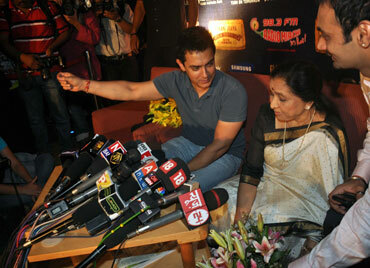 Aamir khan was also present for the special screening of the movie. Directed by Vijay Anand and produced and written by Nasir Hussain the movie starred Nazima, Premnath and Prem Chopra among others. Aamir Khan said the screening of the film again was a great opportunity for the audience. "I think it is a great opportunity for the audiences also, the youngsters of today to see all these films, which are made by such talented people. The actors, directors film makers, writers, composers are all talented," said Khan. Aamir's wife Kiran Rao also came for the film screening of Teesri Manzil. Shammi Kapoor said he is very happy to come and felt proud about his performance. "After 45 years, I am watching what I have done before, and I am very proud of having done something like that, and you have given me the opportunity to come, and I am very happy to be over here," said Kapoor. 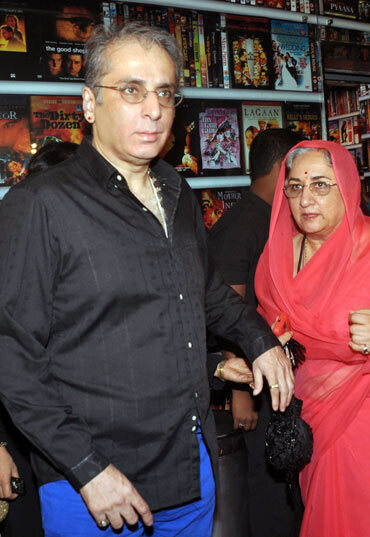 His son Aditya Raj Kapoor along with stepmom Neela Devi Gohil was also spotted at the event. The music of the movie was given by the late R D Burman.